The typically tight-lipped leader shares his passion for Project Loon and building the new Alphabet into a company that is entrepreneur-friendly. That was the overarching subject of the first sit-down in a while for the CEO of the freshly-christened Alphabet, Google’s new parent company. He chatted with Alan Murray at the Fortune Global Forum to talk about where he sees the company going forward with its new structure and increasingly diverse focus. In the rather wide-ranging interview he spoke most passionately about Project Loon, the company’s effort to bring the Internet to large swaths of land where there is no access. “Think about how cellphones have changed your life. Think about how they could change the lives of billions of people,” he said. Privacy is always a hot topic for Google. Not surprisingly, Page thinks some attitudes need to shift in regards to how we think about private information. As an example, he cited the difficulty that some university researchers have in performing genomic research. “We’ve gotten so hung up on privacy,” he said. He also talked Steve Jobs, who has been the subject of multiple film releases lately. 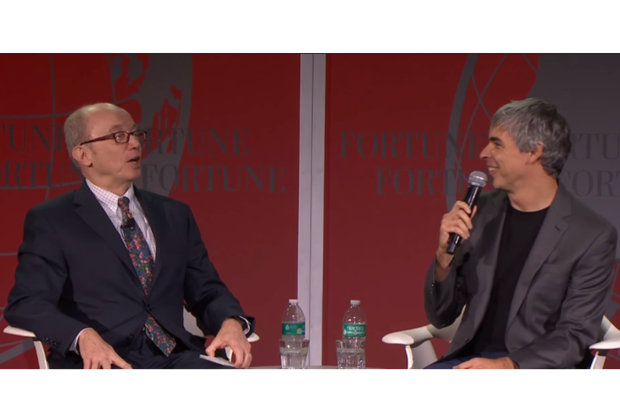 Looking back he said Jobs was correct that Google was pulled in too many directions, which was part of the thought process that led him to push for the creation of Alphabet. He wants the “moonshot” mindset to stay, however, as Alphabet should be “a company for entrepreneurs” that focuses on creative thinking. Why this matters: This brief talk explains quite a bit about why Page decided to re-arrange Google into the umbrella company Alphabet. He wants the company to be an innovator in multiple areas, which goes far beyond Google’s efforts in search, Android, and Chrome. This empowers him to pursue a wide number of interests, with Google pumping out the cash to fund potentially crazy experiments. So far, investors have been pretty happy with the move, but it’s an interesting experiment to watch over time.